Dr. Volk is a graduate of the Johns Hopkins University and a medical school graduate of the Indiana University School of Medicine. He is fellowship trained in sports medicine, shoulder and knee arthroscopy. Dr. Volk holds two Board Certifications with the American Board of Orthopaedic Surgery – one in Orthopaedic Surgery, the other in Sports Medicine. 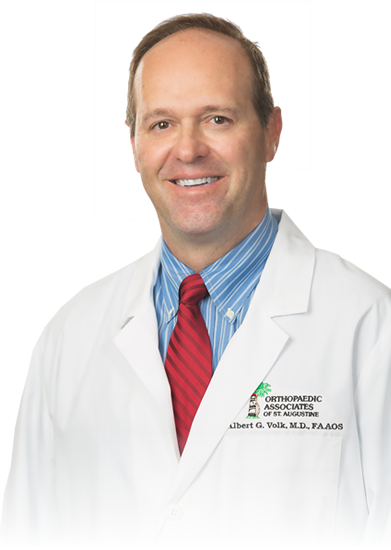 Dr. Volk has a particular interest in treating conditions of the shoulder, specializing in an all-arthroscopic rotator cuff repair of the shoulder, which results in less pain and faster recovery. He is also the past Chief Medical Advisor for the Professional Women’s Tennis Association and has extensive experience in treating professional, collegiate and high school athletes.